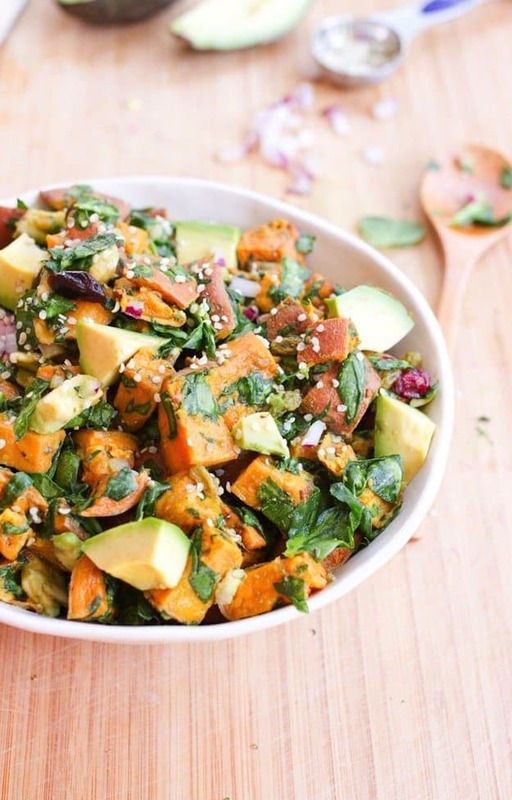 Skip the white potatoes and make this roasted sweet potato salad instead! It has chopped spinach, creamy avocado chunks, red onion and dried cranberries so it’s light, refreshing and perfect for spring picnics and summer BBQs. Vegan + paleo and gluten-free. One of my favorite things about summer as a child was all the family cookouts. My extended family has always been close so it seemed like every weekend we were hosting or attending some sort of cookout or family function. Turns out, many of these “salads” aren’t really the healthiest. I mean watergate salad and strawberry pretzel salad are literally just desserts with the word salad in the name. While I certainly enjoyed all of those side salads as a kid, it never hurts to upgrade a bit. So this month I’m teaming up with a my few of my best blogging buddies to bring you a host of delicious salads for your next BBQ. The best part? They’re all healthy! My contribution to the is this lovely roasted sweet potato salad with spinach, red onion, dried fruit and avocado. Anything with roasted sweet potatoes is bound to be delicious and this roasted sweet potato salad is no exception. There’s no real dressing — just lemon juice and apple cider vinegar, which makes for a sweet and zesty salad. The potatoes can be roasted ahead of time and once that step is done the salad comes together in a matter of minutes. And it’s great served cold (or at room temp) — perfect for BBQs, potlucks and parties. 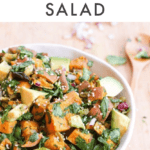 If you make this Roasted Sweet Potato Salad be sure to leave a comment and star rating below letting us know how it turned out. Your feedback is so helpful for the EBF team and our readers! Preheat oven to 400° F. Place sweet potato chunks into a large bowl and toss with coconut oil and sea salt. Bake for 30 minutes or until cooked through, flipping once. Remove from oven and let the potato chunks cool. This step can be done ahead of time. Just keep the roasted potatoes in the fridge and complete step 2 the day you want to enjoy the salad. While the potatoes are roasting, add the chopped spinach, onion, dried fruit, apple cider vinegar and lemon juice in a large bowl. Add cooled sweet potato chunks to the bowl and stir to combine. Gently stir in avocado and add sea salt and ground pepper to taste. Sprinkle on hemp seeds and serve immediately or store in the fridge until ready to serve. Can be eaten cold or at room temperature. Store leftovers in a sealed container for up to two days. If needed, add a splash of extra lemon juice before serving. Watermelon Salad with Basil Ginger Dressing — This watermelon salad is packed with the perfect warm weather flavors! Sweet watermelon drizzled with delicious olive oil, garnished with toasted almonds, bacon, mint, sliced red onion, and a sweet Basil Ginger Dressing, this will be a BBQ hit all summer long! Paleo Pineapple Coleslaw — This clean-eating, paleo coleslaw is made with homemade mayo, a mixture of delicious and colorful vegetables and a pop of pineapple for sweetness! 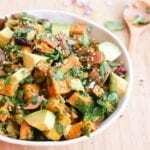 Sweet Potato Salad with Avocado Pesto — This paleo sweet potato salad is mixed with creamy, basil avocado pesto, bacon and eggs for a healthy side dish that is so easy and always a crowd pleaser! Healthy Asian Snap Pea Salad — Get in your greens with this Healthy Asian Snap Pea Salad. It’s super simple to make and coated with a light sesame-ginger dressing. You’ll definitely be going back for seconds! What’s your favorite cookout/BBQ side salad? 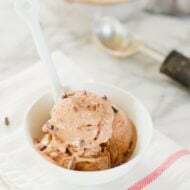 Looooooove the addition of dried fruit to this recipe! So clever. Love my sweet potatoes so you know this recipe is happening! How many dose this serve??? Coconut oil and sweet potatoes is like my most favorite combo ever! So this salad? I need it in my face STAT! Wow! I wish I could eat this through the screen right now! It looks mouthwatering! 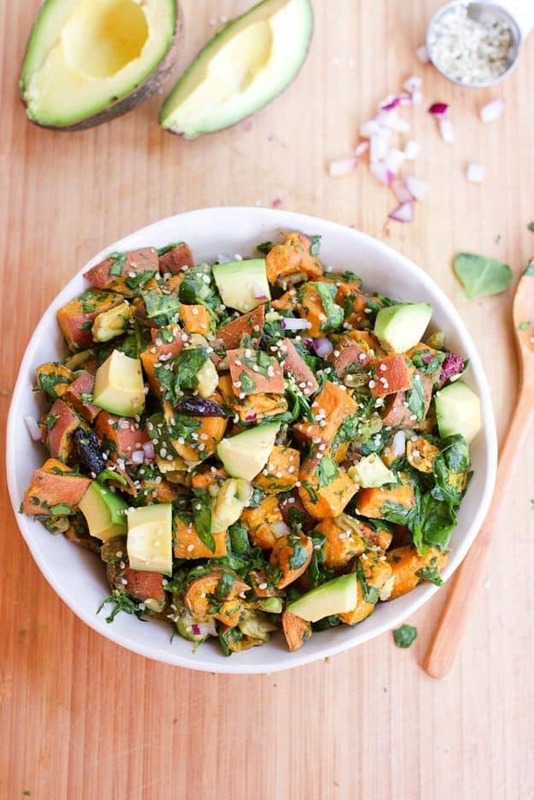 LOVE this sweet potato salad! Can’t it to make it! Your salads line-up makes me hungry. Clean and nutritious food, that’s something I want eat. I’m trying to maintain my weight so I avoid processed food and fast food. Oh my GOSH this looks so good! I need to make this ASAP! This looks amazing! Plus I know my husband will love it too so this has to happen soon! Woo-hoo! I hope you and your husband love them. I’m obsessed with anything sweet potato. LOVE. Me too — especially when roasted! This looks so fresh, refreshing and mouth watering! I can’t wait to try it as I love sweet potatoes! What type of dried fruits make this super yummy!!! I used a mix of dried cranberries and raisins! 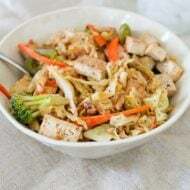 We made this salad for dinner tonight to accompany a pork sirloin roast and must say it was phenomenal. The combination of flavors are wonderful. So glad you enjoyed it, Gwen! Awesome!! I’m so glad you like it. Enjoy, Laurence. 1) think it would do ok frozen and then thawed? 2) do you happen to have the nutritional stats, or even just the recommended serving size? Thanks! Hooray!! So glad it was a hit! Could you possibly give a the weight of sweet potatoes to use? The recipe looks delicious! Wow what delicious food ! I want to produce my food ! Thanks Sarah! You’ll have to let me know how it turns out. 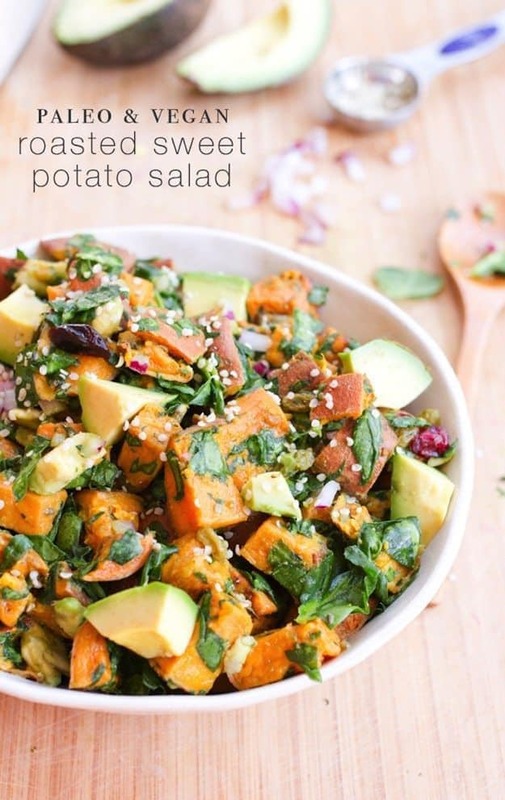 NEVER liked any sweet potato salad recipes before this. If I was into processed meats, I would add bacon to this 🙂 but as listed, the recipe is delicious!! I used golden raisins, and they were a refreshing tart, but not too tart combo. Thank you! Hi Lisa! Hmmm…. I think this should work, but I’m not 100% because I haven’t tried it. Where do you get the frozen pre-cut sweet potatoes? So so so scrumptious! For the dried fruit I put in a trail mix of nuts and raisins and seeds. This is my new favorite salad. Thank you! 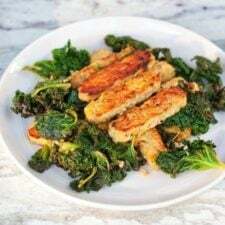 This was delicious – tasty, filling, easy. We had it with some Tofurky sandwiches. Yay! So glad that you enjoyed it, Gary. And thank you so much for coming back and leaving me a comment to let me know how it turned out. I so appreciate it! I made this today and it’s absolutely delicious!!! Very flavorful, light, and amazing!! This one is definitely a keeper!! Yay!! I’m so glad you enjoyed it, Elizabeth. And thank you so much for coming back to leave a comment and star rating. This helps me out so much!